I recently bought a new bicycle after having my old one stolen from under the house (I’ve no luck with bikes – that was the third one I’ve had stolen!). Although I used to ride daily to and from work, it had been over a year since I’d been on a bike; once my pregnant belly started getting in the way at about seven months I had to stop cycling, and since W was born there was never the chance. Now that she is almost one, though, I can steal a few extra hours for myself on the weekends, so on Saturday mornings I jump on my new bike and head into work while S hangs out with W.
From our house to get to my work I cycle alongside the river, sun reflecting off the water, in and out of the shady trees. I had forgotten how much I love bike riding; the sense of freedom in movement, the ease of propulsion. Cycling is both rhythmic and effortless – legs go up, legs go down – a meditative motion. Much like swimming laps, I find the physical exertion clears my mind. Daily life is so full of stimulus; while I’m on my bike though, my mind is free to wander as it wants, letting the debris settle. It promotes untethered thinking, that balanced space where ideas and dreams rise to the surface. Cycling, though, is more than that. It is an embodiment of the way I like to engage with the world around me. I don’t drive a car, so transport for me has always been something that I take the time to enjoy. Trains and buses are a chance to listen to music, read my book, people-watch. These days I love travelling on the bus with W as she makes friends with everyone around her. Cycling is a chance to get some exercise, calm the mind, feel the wind on my face. It is also the best way to discover a city – small cafes in side streets, a beautiful tree in someones front garden, the best grassy spot to sit in the park. Autumn is, of course, the perfect season for cycling. The weather starting to cool, clear skies and long evenings. 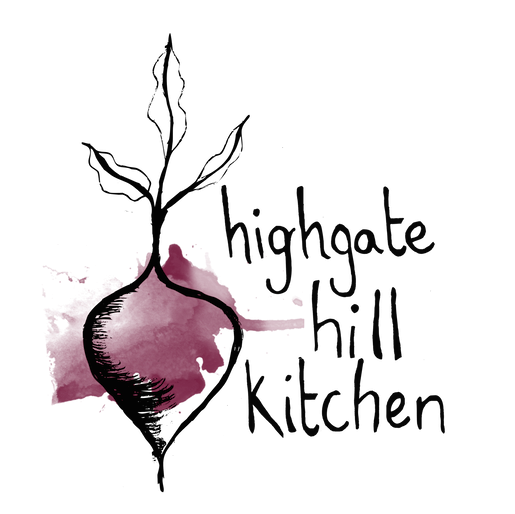 Autumn is actually my favourite month, for its temperate days and lingering twilights, and not least because of the delicious produce. Our co-op box this week came full of squash, persimmon, rhubarb, pears, sweet potato, heirloom tomatoes – so much goodness! This dish, though, is a quintessential autumn salad. 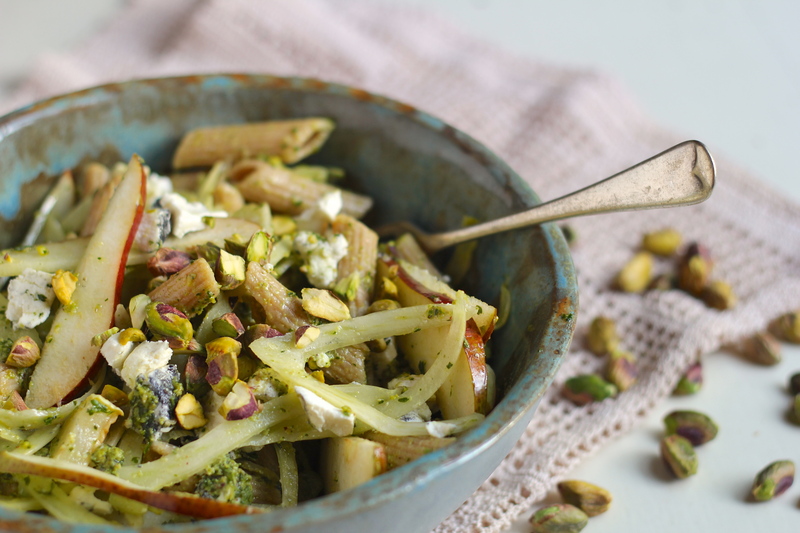 The flavours are delicate and lingering, just enough zing in the pistachio pesto without overpowering the fennel and squash. The pears add a hint of sweetness and the goats cheese a creamy touch. The colours are also wonderfully autumnal; pale green, soft brown, and the red blush of the corella pears. It is simple to make, and delicious for a Sunday night dinner or weekday lunch. And it seems that autumn herself also loves this salad; just as I was taking the photos, a stream of late afternoon sunshine broke through the clouds and spilled across the salad bowl. Heat the oven to 200°c/200°f. Cut the squash into cubes and toss to coat with extra-virgin olive oil, salt & pepper. Place in a single layer on a baking tray and bake for about 25 minutes until starting to char around the edges. In the meantime, boil a pot of water on the stove with a drizzle of olive oil and cook the pasta according to the instructions on the packet. 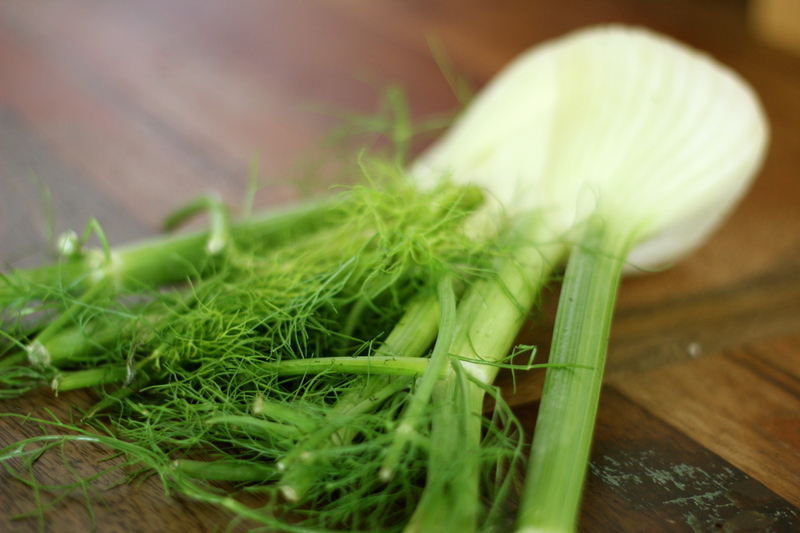 Remove the green tops from the fennel bulb and finely slice lengthways, using a sharp knife or mandoline. Cut the pear in half, removing the core, and cut into thin slices. 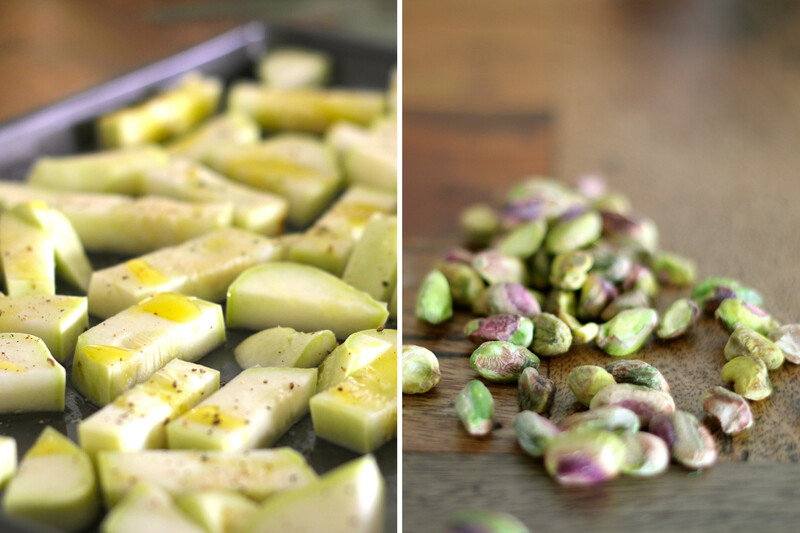 To prepare the pistachio pesto, add the pistachio nuts, parsley, lemon juice, just a pinch of salt, a few generous grinds of pepper, and the olive oil to a food processor. Blend until smooth (you may need to scrape down the sides once or twice), drizzling in a little more oil or a splash of water if the pesto is too thick. Drain the pasta and in a large bowl combine the pasta, baked squash, fennel, and pear. Add the pesto and stir to coat the salad thoroughly. Before serving, crumble the goats cheese in and stir through. 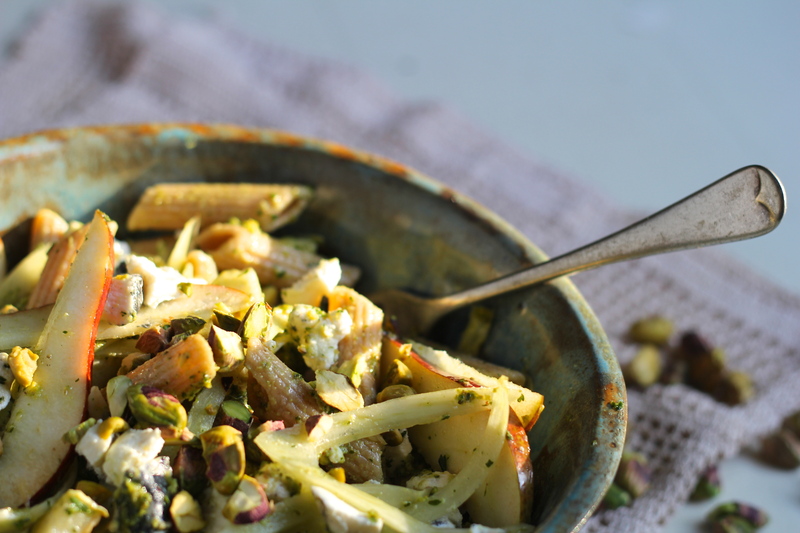 Top with a sprinkling of roughly chopped pistachio nuts. Notes: this is best served on the day it is made, but will keep for a day or two in the fridge. Store covered to ensure the pasta doesn’t dry out, and keep the pesto and cheese separate until ready to serve. 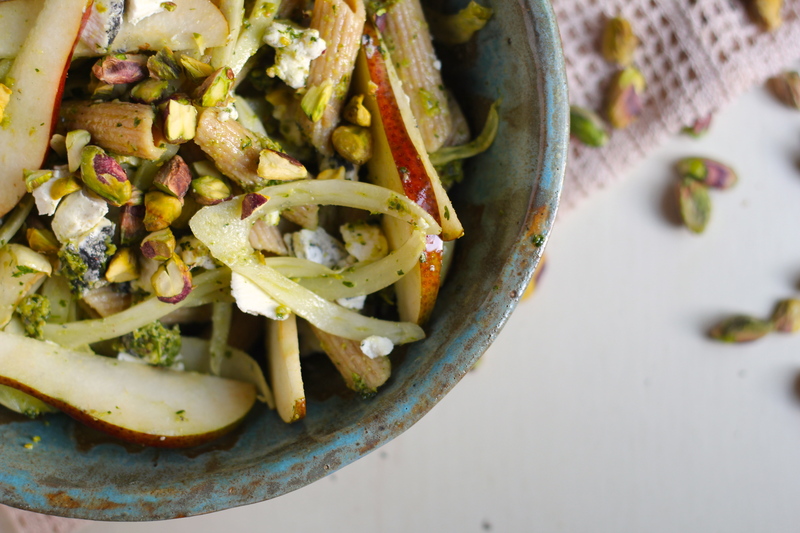 Fennel is a relatively new ingredient for me as well – I’m loving its unique flavour, and the crunch it adds to salads. Check out my White Bean, Fennel and Dill Salad if you’re looking for more ideas. Looks delicious! Pear with pasta is a new one for me, but the flavour profile is exactly my kind of thing, so I’m sure it will be good. It is an unusual combination, but works so well in this salad! It is an unusual combination, but works so well in this dish!